From testing intercontinental ballistic missiles and nuclear bombs, Kim moved to testing diplomatic prospects for the normalization of himself as an international leader and of North Korea as a nuclear weapons state. Supreme Leader and Korean Worker’s Party Chairman, Kim Jong-un, made a consequential shift in January of this year. From testing intercontinental ballistic missiles and nuclear bombs, Kim moved to testing diplomatic prospects for the normalization of himself as an international leader and of North Korea as a nuclear weapons state. Having announced a shift from simultaneous nuclear and economic development to a sole focus on the latter at a party meeting in April, Kim proceeded to pursue a peaceful international environment that would be favorable to economic development. He participated in a series of summit meetings throughout the year, including three each with South Korean and Chinese presidents Moon Jae-in and Xi Jinping, and a landmark meeting with US President Donald Trump in Singapore. Kim leveraged his newfound international recognition to boost his domestic prestige while blunting the full effects of international sanctions on North Korea’s economy. He also attempted to transform the external security environment by overcoming hostilities with the two biggest threats to North Korean security, the United States and South Korea. Kim’s campaign for normalization received essential support from South Korea’s President Moon, who has persistently advocated for a denuclearization-embedded peace process as a substitute to prior international efforts to draw North Korea into a peace-embedded denuclearization process. At his first meeting with Kim Jong-un at Panmunjom in April, Moon sought to marry summitry with process by institutionalizing inter-Korean cooperation in three areas: inter-Korean relations, military tension reduction and denuclearization. In May, Moon and Kim met for a second time at Panmunjom in a joint effort to save the Trump­–Kim summit. The Singapore summit between Trump and Kim was the first ever meeting between US and North Korean leaders. It was undoubtedly the marquee accomplishment for North Korean diplomacy in 2018. The four-point communique concluded at the summit included pledges to reform the US–North Korea relationship, establish peace on the Korean Peninsula, work toward ‘complete denuclearization’ and resume recovery of Korean War POW/MIA remains. Despite repeated efforts by US Secretary of State Mike Pompeo and other officials to jumpstart working-level US–North Korea negotiations, the North Koreans preferred a leaders-only approach to overcoming mutual mistrust. US and North Korean bureaucracies are yet to begin the hard task of hammering out a joint plan consisting of concrete and mutual step-by-step actions toward peace and denuclearization. 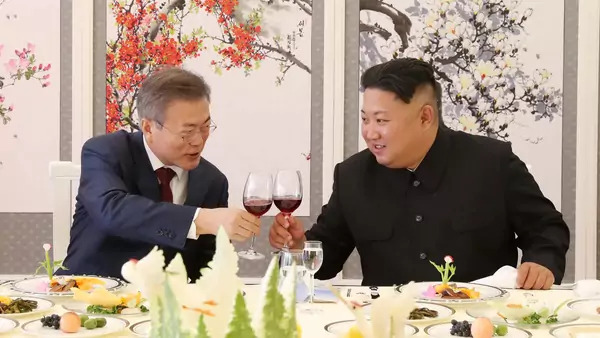 Moon’s efforts to engage with Kim enabled the renewal of inter-Korean cultural and sports exchanges, the resumption of two rounds of family reunion meetings and the establishment of an inter-Korean liaison office at Kaesong. Meanwhile, the two Koreas jointly conducted a survey of the quality and condition of North Korean railbeds in anticipation of restoring inter-Korean railway connections. At September’s Pyongyang summit, Moon and Kim signed a Comprehensive Military Agreement (CMA). The CMA reduced military exercises near the demilitarized zone (DMZ), established no-fly and no-sail zones, removed guard posts inside the DMZ and launched joint recovery operations of Korean War remains inside the DMZ. The CMA marks the first tangible implementation of security and confidence-building measures since the two Koreas first agreed to pursue such initiatives in 1991. But meaningful steps toward inter-Korean peace contrast with the ongoing stalemate over how to proceed on denuclearization. The denuclearization stalemate raises the question of whether conventional tension-reduction measures without commensurate progress toward denuclearization could result in sustainable peace or would instead raise the risk of military confrontation. The stalemate also underscores the diametrically opposed assumptions of the United States and North Korea preceding the Singapore summit. Washington assumed North Korea could successfully be coerced into denuclearization, while Kim pursued a bid to win international acceptance based on his nuclear successes. Kim’s three summits with China’s President Xi Jinping this year represent a seeming reversion to the historical norm of China–North Korea geostrategic co-dependency, despite Xi cold-shouldering North Korea’s nuclear development for the past five years. Kim’s outreach to Trump and North Korea’s need for strategic depth as a basis upon which to engage with South Korea and the United States appear to have swept away mutual inhibitions and distaste in favor of a return to tactical cooperation as a hedge against regional instability. Kim’s normalization gambit remains incomplete in anticipation of leader-level engagement with Japan and Russia. At the same time, an inter-Korean and Trump–Kim diplomatic sequel might yet help to open the elusive pathway toward peace and denuclearization. If 2017 was a year of testing and 2018 a year of summitry, perhaps only Kim knows what 2019 will bring.